Vocals on Hıkoi by Ariana Tikao. 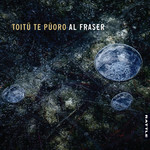 Toitu Te Puoro is his fifth solo album, but he also has collaborated on projects such as Tahu, The Woolshed Sessions, Oro, Shearwater Drift and Ponguru. Working in collaboration with Steve Garden and releasing the album on Rattle ensured that the work reached its full potential, and to have a deserved place among the label's catalogue of award-winning and critically acclaimed albums.